The WCA Income Builder Portfolio seeks to invest in companies with rising dividends at attractive valuations. 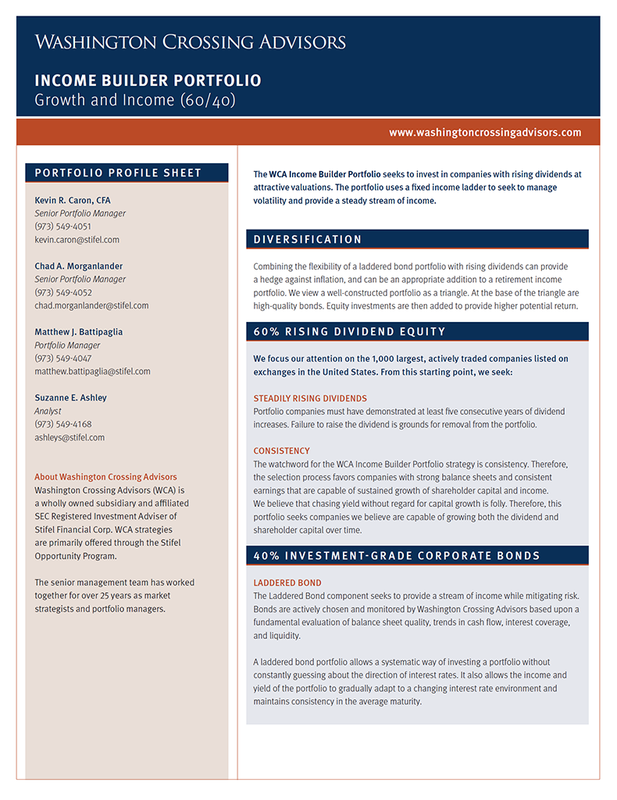 The portfolio uses a fixed income ladder to seek to manage volatility and provide a steady stream of income. Combining the flexibility of a laddered bond portfolio with rising dividends can provide a hedge against inflation, and can be an appropriate addition to a retirement income portfolio. We view a well-constructed portfolio as a triangle. At the base of the triangle are high-quality bonds. Equity investments are then added to provide higher potential return. STEADILY RISING DIVIDENDS: Portfolio companies must have demonstrated at least five consecutive years of dividend increases. Failure to raise the dividend is grounds for removal from the portfolio. CONSISTENCY: The watchword for the WCA Income Builder Portfolio strategy is consistency. Therefore, the selection process favors companies with strong balance sheets and consistent earnings that are capable of sustained growth of shareholder capital and income. We believe that chasing yield without regard for capital growth is folly. Therefore, this portfolio seeks companies we believe are capable of growing both the dividend and shareholder capital over time. The Laddered Bond component seeks to provide a stream of income while mitigating risk. 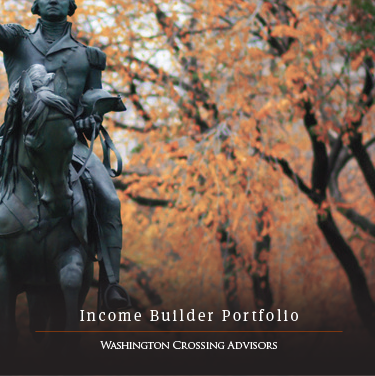 Bonds are actively chosen and monitored by Washington Crossing Advisors based upon a fundamental evaluation of balance sheet quality, trends in cash flow, interest coverage, and liquidity. A laddered bond portfolio allows a systematic way of investing a portfolio without constantly guessing about the direction of interest rates. It also allows the income and yield of the portfolio to gradually adapt to a changing interest rate environment and maintains consistency in the average maturity.